Seth Walsh Died Yesterday. He Was Killed Long Ago. After years of bullying, Seth Walsh, 13, of Tehachapi, hanged himself. Found unconscious and not breathing, he was flown to Kern Medical Center and kept on life support for 10 days. He died Tuesday. A memorial service is planned for Friday, October 1st. Asher Brown, 13, of Houston, shot himself. Billy Lucas, 15, of Greensburg Indiana, hanged himself. All three of these suicides occurred this month, and were due to anti-gay bullying. Seth had endured years of harassment, both at school and at a local park. School officials at Jacobsen Middle School say they had no reports of bullying, but had placed Seth in independent study this term, after only 2 weeks of school. Police in Tehachapi say there is no law against bullying, so they cannot prosecute Seth’s tormentors. Asher and Billy were also harassed for being gay, or thought gay, and finally took their own lives. Meanwhile, across this country, right-wing religious nutjobs continue to fight anti-bullying laws, claiming they are part of the “gay agenda”, meant to promote homosexuality. Sounding pious and self-righteous, they would prevent schools from teaching diversity, tolerance, and respect, especially if sexual orientation is mentioned. Some have even gone as far as to publicly claim that Billy Lucas was going to hell for embracing homosexuality. I find myself wishing hell actually existed, so that there could be a special place in it reserved for these people. Trevor Project Responds To Recent Tragedies | Blog. Star Trek Geek – Don’t Harass A Trekker! It might all be a joke to you, but then again, it might not be! The last Space Shuttle External Tank heads for the VAB. This tank will be used for STS-134, the last flight of the shuttle program. After STS-134, NASA will not have a manned spacecraft for years. Until then, we hitch a ride with the Russians. Recently I’ve had two blog posts to the Visalia Times Delta’s site deleted within hours of posting them. Both were gay related (imagine that), one being a response to finding an anti-gay paper on my car at Saturday’s Family Fest at Mooney’s Grove, and the other an announcement about today being National Gay Men’s HIV/AIDS Awareness Day. Both seemed rather innocuous to me, but someone found them offensive, flagged them, and they were removed. I’m not sure if the removal is done by a person, or if it’s done automatically, but it doesn’t take long to figure out what’s going on. Someone doesn’t like me, and really doesn’t like that I publicly advocate for gay rights issues. This person has created several profiles, and posts comments and blogs from several screen names. The common thread? “They” are all from Porterville, and sometimes list similar other items in the profiles, if they don’t set it to “private”. Now, I’m NOT saying they’ve created all these screen names and profiles just to pick on poor little Jimmie. He/she has used them against other blog posters as well, so I’m in rather respectable company. This blog, however, is just about my experiences. Did you know I was a sociopath? A coward stalked Mooney’s Grove today. He (or she) snuck around and stuffed a folded paper under the windshield wipers of cars parked near Gay Visalia’s second annual Family Fest celebration. A full page of homophobic ramblings, unsigned and unattributed, lacking in coherence, logic, or facts. Normally I wouldn’t give this kind of thing a second thought, simply crumpling the flyer and tossing it in the nearest trash can. Today, though, I think I’ll do something a bit different. I’m going to respond, as best I can, to the points the author (whoever it was) tried to make. It’s going to be a rambling post, but that’s due to the flyer’s incoherence. Hang in there, and see how the homophobes imagine you. 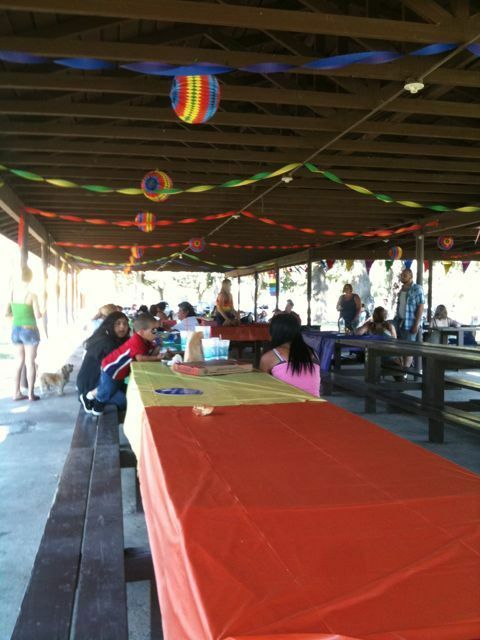 I’m out in the sunshine, here at Mooney Grove, at Gay Visalia’s Family Fest. A good turnout, lots of young people, and folks with their kids. I’m a bit disappointed in him right now. The alternative isn’t acceptable, so I’m sure I’ll vote for him again, but he’s not living up to his promises.